What is a global interpreter lock and why is it an issue? A lot of noise has been made around removing the GIL from Python, and I'd like to understand why that is so important. I have never written a compiler nor an interpreter myself, so don't be frugal with details, I'll probably need them to understand. Note that Python's GIL is only really an issue for CPython, the reference implementation. Jython and IronPython don't have a GIL. As a Python developer, you don't generally come across the GIL unless you're writing a C extension. C extension writers need to release the GIL when their extensions do blocking I/O, so that other threads in the Python process get a chance to run. Suppose you have multiple threads which don't really touch each other's data. Those should execute as independently as possible. If you have a "global lock" which you need to acquire in order to (say) call a function, that can end up as a bottleneck. You can wind up not getting much benefit from having multiple threads in the first place. To put it into a real world analogy: imagine 100 developers working at a company with only a single coffee mug. Most of the developers would spend their time waiting for coffee instead of coding. None of this is Python-specific - I don't know the details of what Python needed a GIL for in the first place. However, hopefully it's given you a better idea of the general concept. Any operation/instruction is executed in the interpreter. GIL ensures that interpreter is held by a single thread at a particular instant of time. And your python program with multiple threads works in a single interpreter. At any particular instant of time, this interpreter is held by a single thread. It means that only the thread which is holding the interpreter is running at any instant of time. Your machine could be having multiple cores/processors. And multiple cores allow multiple threads to execute simultaneously i.e multiple threads could execute at any particular instant of time.. But since the interpreter is held by a single thread, other threads are not doing anything even though they have access to a core. So, you are not getting any advantage provided by multiple cores because at any instant only a single core, which is the core being used by the thread currently holding the interpreter, is being used. So, your program will take as long to execute as if it were a single threaded program. However, potentially blocking or long-running operations, such as I/O, image processing, and NumPy number crunching, happen outside the GIL. Taken from here. So for such operations, a multithreaded operation will still be faster than a single threaded operation despite the presence of GIL. So, GIL is not always a bottleneck. Edit: GIL is an implementation detail of CPython. IronPython and Jython don't have GIL, so a truly multithreaded program should be possible in them, thought I have never used PyPy and Jython and not sure of this. Python doesn't allow multi-threading in the truest sense of the word. It has a multi-threading package but if you want to multi-thread to speed your code up, then it's usually not a good idea to use it. Python has a construct called the Global Interpreter Lock (GIL). The GIL makes sure that only one of your 'threads' can execute at any one time. A thread acquires the GIL, does a little work, then passes the GIL onto the next thread. This happens very quickly so to the human eye it may seem like your threads are executing in parallel, but they are really just taking turns using the same CPU core. All this GIL passing adds overhead to execution. This means that if you want to make your code run faster then using the threading package often isn't a good idea. There are reasons to use Python's threading package. If you want to run some things simultaneously, and efficiency is not a concern, then it's totally fine and convenient. Or if you are running code that needs to wait for something (like some IO) then it could make a lot of sense. But the threading library wont let you use extra CPU cores. Whenever two threads have access to the same variable you have a problem. In C++ for instance, the way to avoid the problem is to define some mutex lock to prevent two thread to, let's say, enter the setter of an object at the same time. Multithreading is possible in python, but two threads cannot be executed at the same time at a granularity finer than one python instruction. The running thread is getting a global lock called GIL. This means if you begin write some multithreaded code in order to take advantage of your multicore processor, your performance won't improve. The usual workaround consists of going multiprocess. Note that it is possible to release the GIL if you're inside a method you wrote in C for instance. The GIL issue is still valid in Python 3000. Is Python variable assignment atomic? 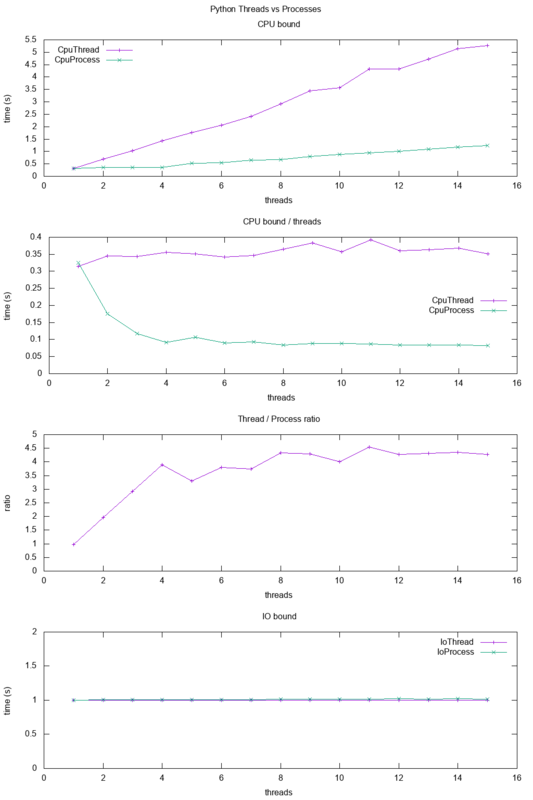 from which we conclude that ThreadPoolExecutor is only suitable for I/O bound tasks, while ProcessPoolExecutor can also handle CPU bound tasks. The following question asks why the GIL exists in the first place: Why the Global Interpreter Lock? At Multiprocessing vs Threading Python I've done an experimental analysis of process vs threads in Python. In CPython, the global interpreter lock, or GIL, is a mutex that prevents multiple native threads from executing Python bytecodes at once. This lock is necessary mainly because CPython's memory management is not thread-safe. How to remove it from Python? Like Lua, maybe Python could start multiple VM, But python doesn't do that, I guess there should be some other reasons. In Numpy or some other python extended library, sometimes, releasing the GIL to other threads could boost the efficiency of the whole programme. Now consider the events in the sequence resulting a dead-lock. Not the answer you're looking for? Browse other questions tagged python python-internals gil or ask your own question. How to run a single python function from C++ using threads several times? Will Python use all processors in thread mode? What is C#'s version of the GIL?